Fried Chicken Biryani – delicious! After a hectic week, you deserve a break. Add extra zing in your weekend with this Indian One Pot Meal recipe which you and your partner can cook together this weekend and set the kitchen on fire. Chicken – I choose Drumsticks and Thighs, (thigh has the best meat of Chicken). Skin removed, and shaved off most fat. Mix all ingredients (except Oil) under 'Marinade' and rub into the Chicken, marinate overnight for best results, if not atleast 4 hours in a fridge, covered. Chop Ginger / Garlic / Tomatoes / Onion finely and store separately. Clean and cut the Coriander Leaves. Wash Rice once and soak in cold Water for 30 minutes. Drain, keep aside till required. Fried Chicken Biryani - Delicious! Edit. Copy. Sell or transfer for a price. All material is based on true experiences and personal opinions. All effort has been taken to make the information as accurate as possible. any information gained you are assuming full responsibility for any and all issues. To view this discussion on the web visit https://groups.google.com/d/msg/indian-food-recipes/-/pHrttpyljxUJ. Fwd: FW: Please read and then forward to others ! ! ! Subject: FW: Please read and then forward to others ! ! ! 1. TATAs took 100 years to become billionaire, Ambanis took 50 years(after utilizing all its resources), where as Robert Vadra took less than 10 years to become fastest multi billionaire. 2. All newspapers are scared to discuss the story of Robert Vadra because of severe threat from Sonia Gandhi and Congress govt. 3. After Robert Vadra got married with Priyanka Gandhi, Robert's father committed suicide under mysterious circumstances, his brother found dead in his delhi residence and his sister found dead in mysterious car accident. These reports were not published in any Indian media. 4. He is having stakes in Malls in premier locations of India, he is having stakes in DLF IPL, and DLF itself. He was involved in CWG corruption - DLF was responsible for development of Commonwealth games, and Kalmadi gave favoritism to DLS because of Robert Vadra's direct interest and business partnership with DLF. 8. He owns prime property in India specially commercial hubs, and taxi business but for Air Taxi. He owns few private planes as well. 9. He has direct link with Italian businessman Quatrochi. 10. 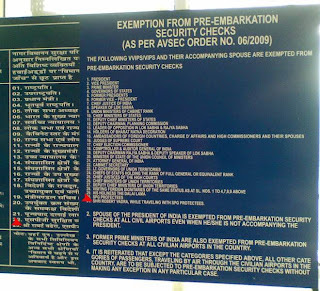 The Bureau of Civil Aviation Security has created a record of sorts by according special privilege to Robert Vadra, which entails him to walk in and out of any Indian airports without being subject to any security check. 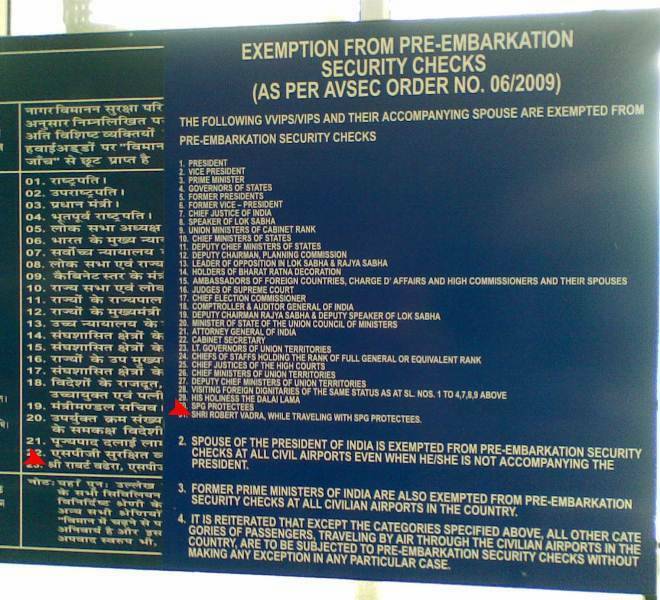 Only the President of India , Vice-President and a handful of other top dignitaries were accorded this rare distinction. As a concerned citizen, I would like to know from the Government as to what was the special quality in Mr. Vadra that merited this rare honor. The government has no right to go in for such largesse that concerns with the security of the general public just for pleasing the son-in-law of Sonia Gandhi. WAKE UP FELLOW INDIANS! FIGHT AGAINST CORRUPTION!!!!!!! To view this discussion on the web visit https://groups.google.com/d/msg/indian-food-recipes/-/pbMmZ4ed3OwJ.